In this short tutorial, you will learn what the Excel formula bar is, how to restore a missing formula bar in different versions of Excel, and how to expand the formula bar so that a long formula can fit into it entirely. On this blog, we have lots of tutorials discussing various aspects of Excel functions and formulas. But if you are a novice in Microsoft Excel, you might want to learn the basics first, and one of the essentials is the Formula Bar. What is a formula bar in Excel? 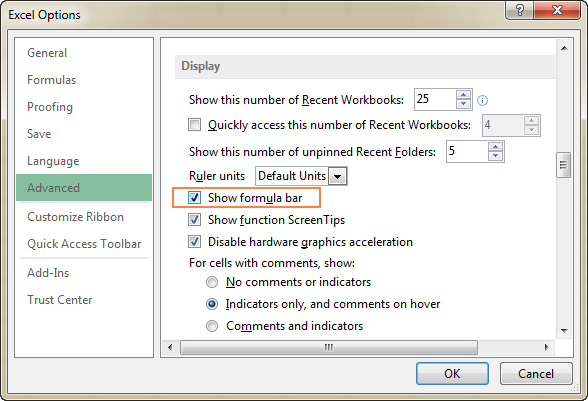 Excel formula bar is a special toolbar at the top of the Excel worksheet window, labeled with function symbol (fx). You can use it to enter a new formula or copy an existing one. The formula bar comes very handy when you are dealing with a pretty long formula and you want to view it entirely without overlaying the contents of the neighbor cells. The formula bar gets activated as soon as you type an equal sign in any cell or click anywhere within the bar. Formula bar is very helpful for reviewing and editing formulas in your worksheets. If the formula bar is missing in your Excel, most likely it's because you've accidentally turned off the Formula Bar option on the ribbon. To recover a lost formula bar, perform the following steps. In the modern versions of Excel, you can unhide formula bar by going to the View tab > Show group and selecting the Formula Bar option. In Excel 2007, the Formula Bar option resides on the View tab > Show/Hide group. In insert the formula bar in the old Excel versions, go to Tools > Options, then switch to the View tab, and select the Formula Bar checkbox under the Show category. Click File (or the Office button in earlier Excel versions). Click Advanced in the left pane. Scroll down to the Display section and select the Show Formula bar option. Hover the mouse near the bottom of the formula bar until you see the up-and-down white arrow. Click that arrow and drag down until the bar gets big enough to accommodate the entire formula. Another way to expand the formula bar in Excel is by using the shortcut Ctrl + Shift + U. To restore the default formula bar size, press this shortcut again. This is how you work with formula bar in Excel. In the next article, we are going to talk about more serious things such as evaluating and debugging Excel formulas. I thank you for reading and hope to see you on our blog next week! 23 Responses to "Formula bar in Excel: how to show, hide, expand or collapse"
its working fine but want to add some more criteria to it. I like Excel 2016 very much. However I am having a problem with the formula bar because the font is boxy and almost too small to read. Is there a way to modify the font in the formula bar? Thank you very much for your assistance. File > Options > General, the section 'When creating new workbooks' > Font size. For the changes to take effect, restart Excel. The next time you open Excel, everything will be big. However, if you open an existing Excel workbook that was created and saved in normal size, only the font of the formula bar will change. Thanks Svetlana for the directions on how to make the font in the formula bar bigger. Maybe now I will be able to see when I duplicate the minus sign by mistake! You are very helpful. Hi i want to knw how to get the Workspace in ms excel if somehow that window is lost by chance and only formula bar is appearing. Even if i give normal view also that window for Workspace is not regained. Once after a new blank workbook is created it will come but either the row numbers will disappear or the window will open with some grid lines. Thank You - I didn't realize it was that simple! I cannot use the NORMAL controls of Excel.. It has something to do with Formula Bar and is INFURIATING because a simple spreadsheet CANNOT be writen!! I have used Excel for 30 YEARS on and Off!! I would like to ask you for help with displaying text in formula bar in excel2013. I use a filter ran by macros. It should filter hugh amount of data and it works, but I need to display in formula bar in final (filtered sheet) original text from source sheet instead of link "=source!F22". I tried to use F9 and it shows me text as I wanted, but when I made a change in source sheet, that change has not been transfered in to the filtered sheet, because F9 replace permanently link by text. thank you. I searched for ages to find your post. I'm using MS Excel 2016 MSO. In the formula bar in some but not all of my excel files, the box that shows cell contents (and allows editing thereof) has disappeared. The cell address box remains. How do I get the missing box to reappear on the formula bar? How did I make it disappear? Is there any way to still see the formulas in the formula bar after an excel document has been electronically signed (and therefore locked) just for read-only purposes? Totally agree with Dapacha - the Excel formula bar keeps disappearing after I've been working for 30 minutes or so. The only way to restore it has to been completely reboot. Mary - Any answer to your issue? I know it was a few years ago - but I am experiencing exactly what you described. Formula bar checked on, but still not showing. Disappears after a few minutes of work. Excel 2013. Tried the Control-Shift-U, it has an impact - the amount of white space increases or decreases - but there's no formula bar. Almost if it's shifted to right well beyond the screen. Thank you for great post. It is very informative to gain knowledge. Great article, but my Excel has a further problem. By whatever means I enable the Formula Bar, it never sticks. I save and close the file after enabling the Formula Bar, but upon reopening it's always turned off again. Any ideas? I am have the similar issues.The box of formula bar extended all the way out to the left. And I still cannot see the edge of the left side after the worksheet is stretched out completely on the double screen display. What Can I do? I'm using MS Excel 2013.How can I get one MASTER FORMULA BAR like MS Excel 2010 when I arrange two or more excel file.